Are you in the Chicago area and looking for something completely different to do? Ready to leave the urban jungle for a taste of farm life? 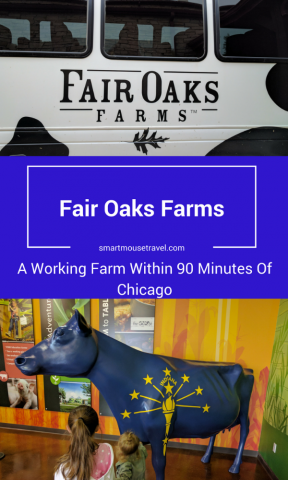 Then it’s time to visit Fair Oaks Farms in Indiana, less than 90 minutes from downtown Chicago. Fair Oaks Farms is a great day trip from either Chicago or Indianapolis. What Is Fair Oaks Farms? Fair Oaks Farms is a working farm with 19,000 acres of land. Around twenty percent of the land is reserved as woods and natural habitat. There are approximately 37,000 cows and 80,000 pigs that reside on the farm over the course of a year. Fair Oaks Farms is located in Fair Oaks, Indiana about 80 minutes southeast of Chicago or 90 minutes northwest of Indianapolis. For planning purposes please note Fair Oaks is in the Central Time Zone. There are two different livestock tours: the Dairy Adventure or the Pig Adventure. You can choose to do one tour or register for both. The Crop Adventure and Mooville activities are included with either tour. The Dairy Adventure teaches you how Fair Oaks Farms raises and milks their Holstein cows. You take a bus ride through working free stall barns, and then get to see the milking process. A free stall barn means the cows can choose anywhere they like to eat and sleep in between milkings. On the bus tour we learned that Fair Oaks Farms runs a very eco-friendly farm. They collect the cow manure, process it, and use the gathered methane to run generators to power many buildings. The leftover solids are used to enrich top soil at the farm. After driving through the free stall barn you arrive at the milking barn. The guide teaches how the cows are milked and the process of cooling the milk for transport. My favorite part of the milking barn is seeing the cows self-load and unload from the “dairy go round”. It only takes the cows three days to learn how to load and unload themselves for milking. The milking process at Fair Oaks Farms provides 350,000 gallons (1.3 million liters) of milk each day. Back at the main visitors’ area check the stoplight outside the Birthing Barn. Generally, four to eight calves are born in this viewing area each day. Red means you have some time, yellow means hooves out, green means the head is out so you better run if you want to see the calf born! Elizabeth loved the whole dairy adventure. Mini Mac (my 2-year-old niece) liked the birthing barn, the “dairy go round” milking machine, and the games inside the Dairy building best. The Pig Adventure takes you out to a fully enclosed, air conditioned, three-barn learning center. 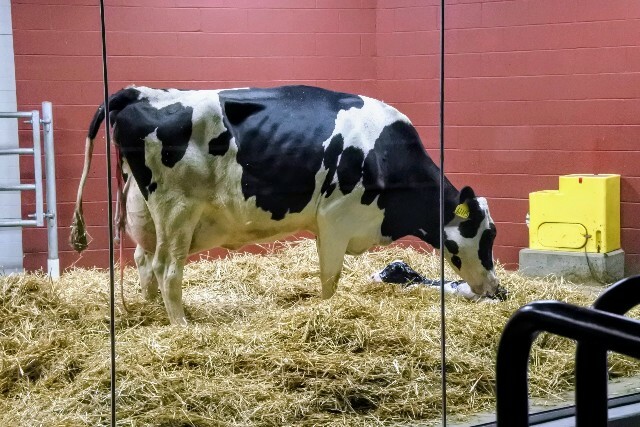 This learning center has large viewing windows that overlook pens to see pigs being born, gestating, and growing. There are also educational displays to learn more about pig farming. Staff are found around viewing areas and can be a great resource if you have questions. 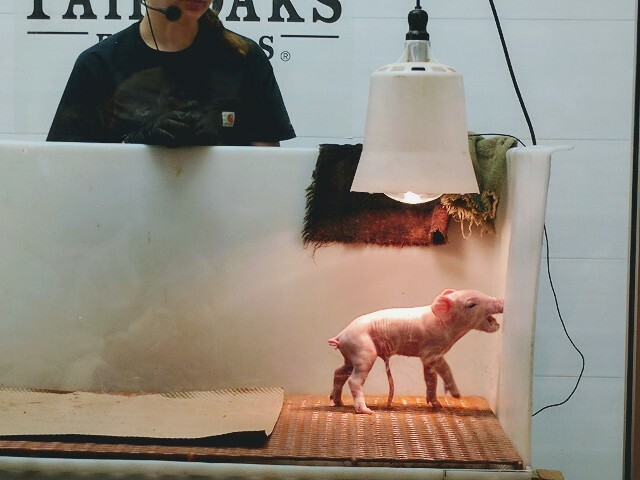 Several times a day a farmer brings a brand new piglet upstairs to a special viewing area (behind glass). At these scheduled educational sessions a staff member teaches participants about piglets and answers questions about the nearly 250 piglets born each day at the farm. Entrance to this exhibition is currently part of your admission into either the Dairy or Pig Adventure. 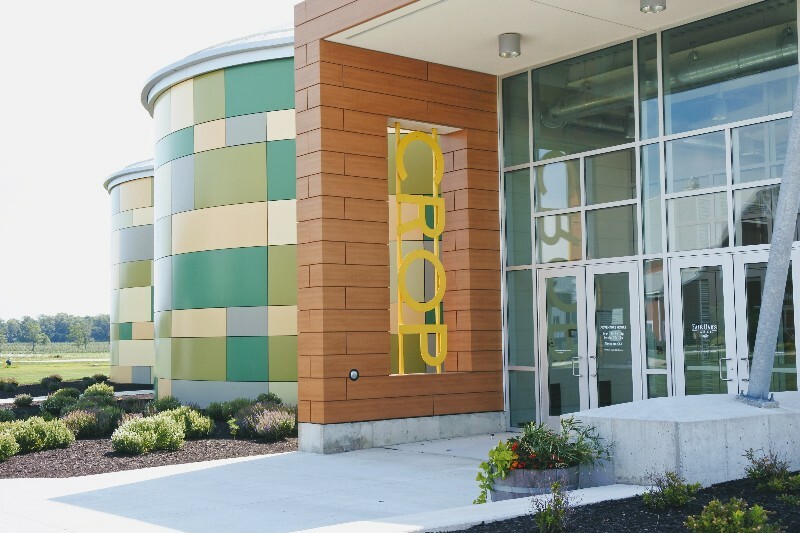 This exhibit walks you through how farming was done in the past and how technology is improving how crops are grown. There are many hands-on exhibits for kids to explore. The Crop Adventure is certainly worth stopping by even if you only visit briefly. Do the kids need to run around a bit after all that learning? Then take them to Mooville where there are several fun outdoor activities. There is rock climbing, a bungee trampoline, a bounce area, a miniature train, and tractor bikes to burn off some energy. Please note there are height and weight restrictions for some of the attractions. Are you hungry yet? Then check out The Farmhouse or Cowfé. 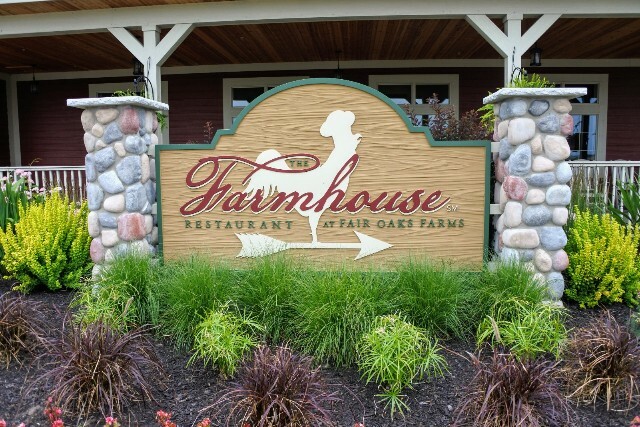 The Farmhouse serves delicious farm to table meals in a stylish rustic setting. 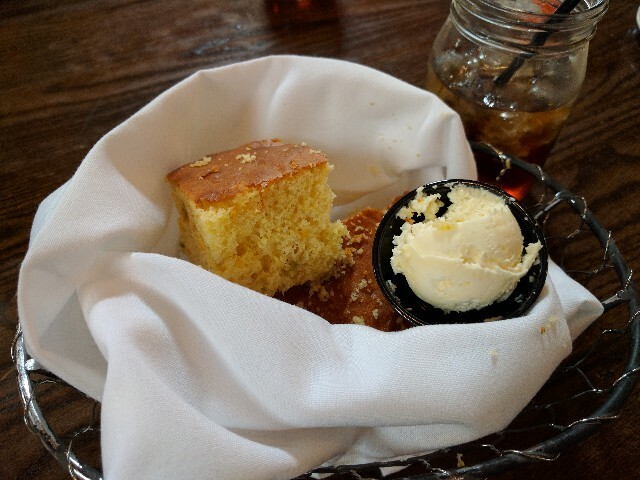 The cornbread, fried chicken, pulled pork BBQ sandwich and fresh brewed raspberry tea were a hit with our group. Want something a little more casual? Head to the Cowfé for grilled cheese sandwiches, salads, and other snacks. We always make sure to save some room for the ice cream. It is delicious! Fair Oaks Farms is the largest agritourism destination in the United States and a unique day trip from Indianapolis or Chicago. The farm is a fun and interesting way to learn about an eco-friendly working dairy and hog farm. I highly recommend you take the short drive away from Chicago or Indianapolis, and show your kids something about life in the country. 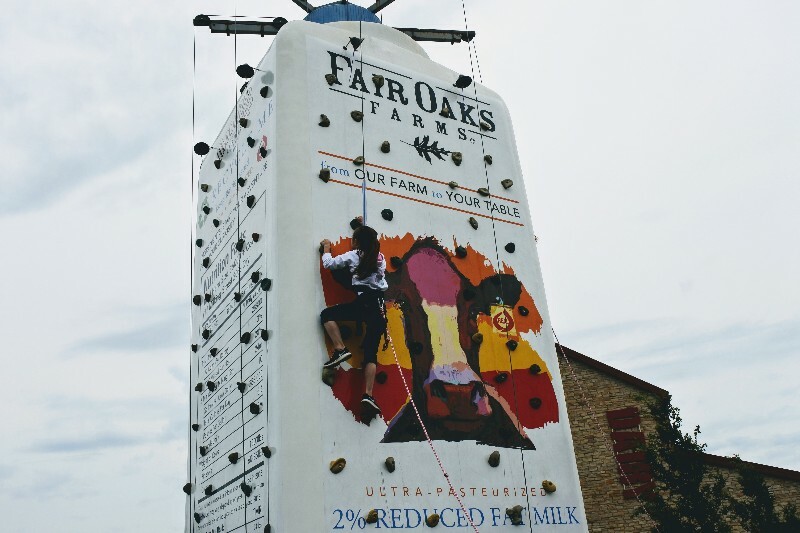 A visit to Fair Oaks Farm will be a unique, and delicious, experience for the whole family. Learn more at the Fair Oaks Farms website. 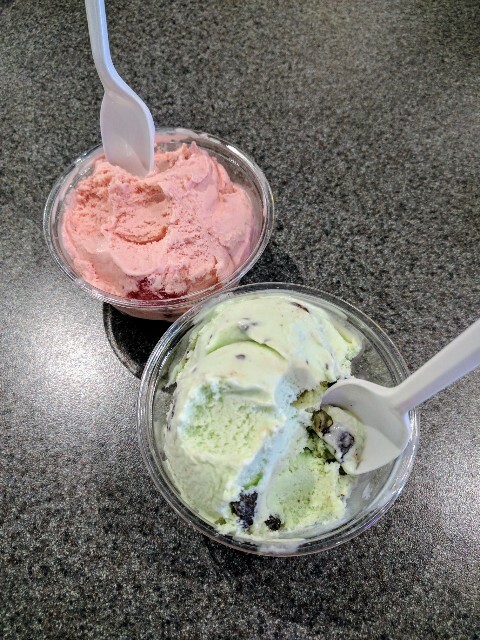 Mmmmmm…fresh ice cream is a great reason to visit a farm!